Cupola Trio are Oli Matthews, Doug Eunson and Sarah Matthews they play English and European dance music and sing English songs in three part harmony. 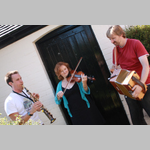 Incorporating melodeons, hurdy gurdy, saxophones, clarinet, fiddle and viola, these three highly talented musicians and singers weave intricate harmonies and beautiful melodies. We have waited a long time for their return and we know you will not be disappointed so bring your singing voices with you.